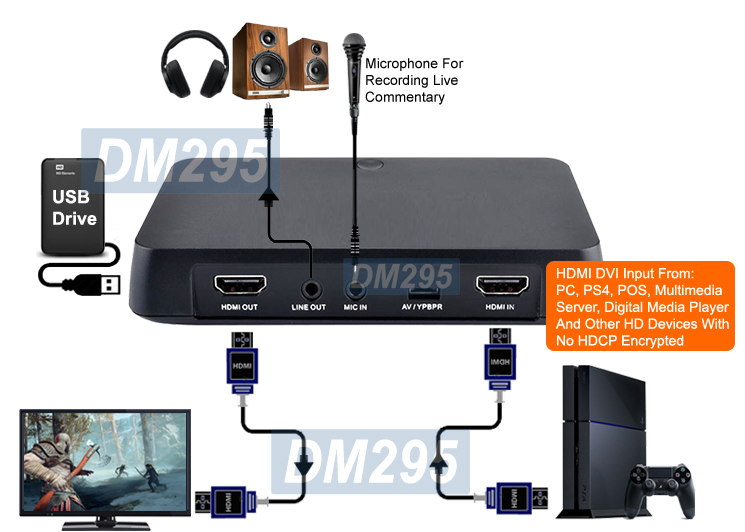 This stand alone HD DVR recorder allows user to record their favorite video game play, TV shows, computer HDMI DVI video, surveillance camera or other HD/SD video content into 1080p HD files and saved into an external USB hard drive or USB flash drive of user choice. Recording quality is selectable. Users can monitor what is being recorded on HDTV or HDMI monitor in real time with no lags. Direct playback and media player function so users can play back the recorded video or watch other digital files directly on TV. Bonus video editing software for users to edit or combine recorded videos or adding transitions, digital effects, video text, titles for post production. This HD video recorder supports all USB hard drive or USB flash drive sizes up to 2 TB maximum in either FAT/FAT32 or NTFS format but not exFAT format. This is one of the very few models that can support 4K HDMI input at 3840x2160 pixels. So users can use this DVR to record 4K HD video into 1080p video files. This HD recorder is built with top quality H.264 HD hardware encoder. Any video device can be captured into H.264 MPEG-4 format, which takes much less(1/3) of the hard drive space than what a MPEG-2 DVD file requires, and retaining same crisp clear images and sounds. A 16 GB USB drive can hold approximately 2 hours of footage at full 1080p resolution. Other video formats such as such as AVI, MPEG1, MPEG2, WMV, QTMOV, ASF can be available by converting from the recorded videos using the supplied video software in the package. This digital video recorder supports timer function. 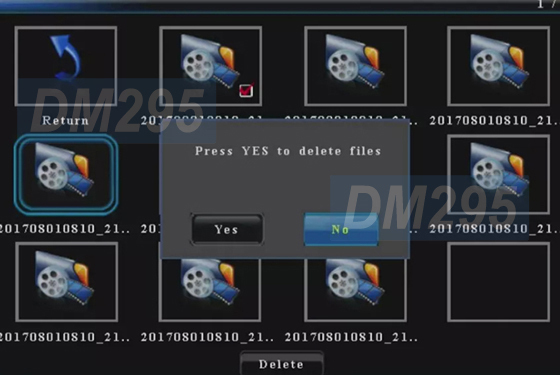 Users can pre-set the starting time and length of recording time from the on-screen menu to auto save the recorded video into USB drive of user choice. 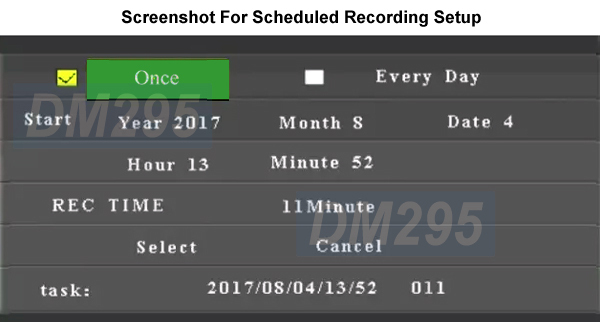 Users have option to choose between one-time recording or daily recording. And the scheduled recording time interval can start from 6 minutes to 550 minutes maximum. [Note]: Users can only set up 1 recording schedule at a time. This DVR does not support scheduling for multiple recording tasks at different time intervals. This digital video recorder also supports Time Stamp function. Users can see the clock time info on the upper left hand corner of the screen when recording. 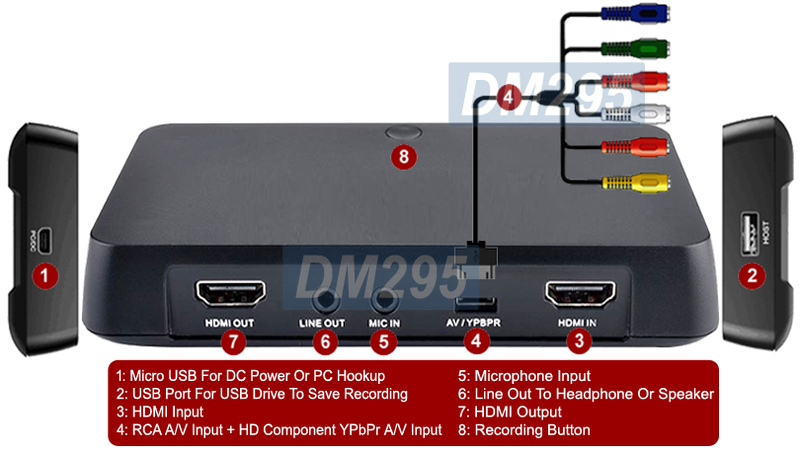 Users can use this HD DVR for recording HDMI or DVI output from computer, HD media player, PS4, CCTV system or other HD devices into digital files for education, training, tutorial, presentation or entertainment purpose. 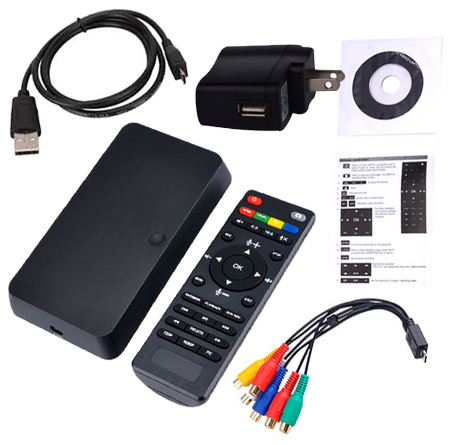 This DVR can also record component YPbPr video and composite RCA video output from game console, DVD/VCR player, surveillance camera, camcorder, etc. Video recording quality is selectable at 1080p/30Hz, 720p/60Hz or 1366x768 pixels. Enjoy stunning HD quality playback directly from this DVR after recording. [Note]: This device will not allow recording of HDMI content with HDCP encrypted from commercial sources such as Blu-ray player, HD cable box,etc. 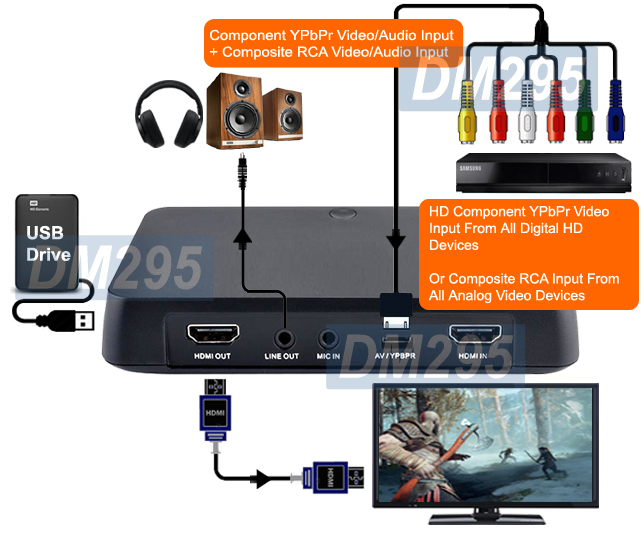 Users may use component video output, if available, from such HD source for HD video recording. This HD DVR supports 2 operation modes. It can be used as stand alone HD recorder with no computer hookup required or plug into PC USB port with driver setup as an USB video capture device for PC Windows OS. This HD DVR also provides users with microphone input for optional use. Users can add live commentary into recording. Users can play and record games full screen at the same time, preserving smooth gameplay - especially for fast-moving FPS and sports games. 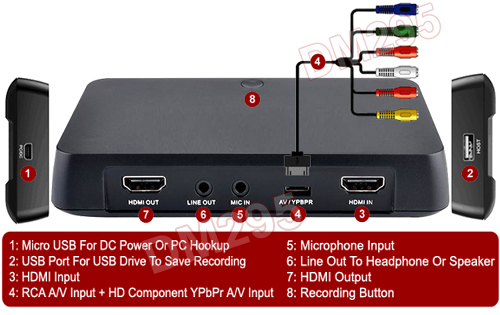 Any video game console with component video output such as PS3, Xbox one, Xbox 360 and Wii U or newer PS4 with HDMI output can be recorded through this DVR recorder into external USB storage device for playback or disc production later. 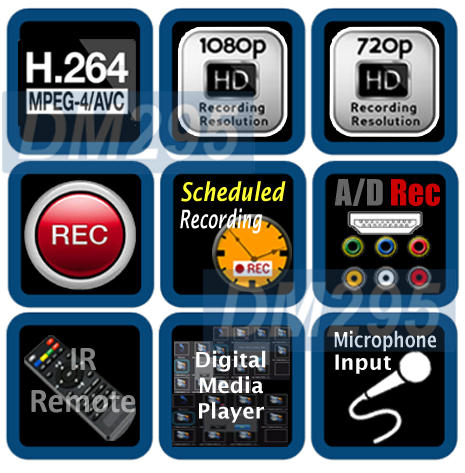 This multi-function HD recorder provides IR remote, which allows users to select video input source, instant or schedule recording, video recording quality, picture adjustment, media playback control, etc. All control functions can also be accessed from the on-screen menu too. This video converter also supports media playback function through its USB port. 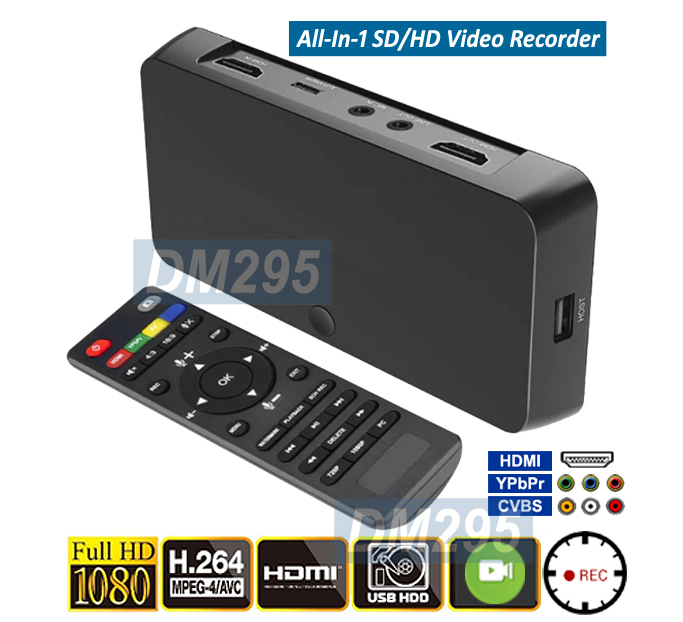 Users can connect USB drive to this recorder to play recorded videos, movies, photo images, photo, music or text files through its HDMI output to TV or LCD monitor. The recorded HD videos can be played back directly from this recorder to TV, unlike most recorder models that need to use computer or separate media player to play the recording. The media player function of this video recorder can be controlled through using the supplied IR remote controller for major functions such as play, pause, stop, delete files and other control buttons, which are all accessible from the on-screen menu too. Photo files: JPEG, BMP and PNG files for image formats. The bundled video editing software provides users with tools to record/import videos, create movies with digital effects or adding transition, still images, text while editing the recorded footage for training or educational purpose or disc production. Users have options to convert the recorded video files into various output formats such as AVI, ASF, MP4, MPEG1, MPEG2, WMV, QTMOV, etc for playback on devices such as Apple TV, iPhone, iPad, iPod, PSP, PS3, Xbox and many other mobile devices. The video text function of the software provides an easy interface for users to type in the text content with selectable font style, size, position, color for the title text or subtitle directly on the preview window. The authoring function is handy when making discs with menus, chapters and scene selection. Simply follow the steps or use the provided templates before burning your content to VCD or DVD disc. Stand alone HD video recorder with H.264/ hardware encoder built in. Real-time HD video capture using H.264/MP4 AAC hardware codec so less file size and less storage drive space needed. Recording in sharp and clear MPEG4 format and stored into a USB drive of user's choice. Can be plugged into PC USB port with driver setup as an USB video capture device for PC Windows OS. Supports HDMI input at 4K, 1080p, 1080i, 720p, 576p and 480p. Supports HDMI output/pass-through so users can view the HD videos while recording performed simultaneously. Supports Time Stamp function. Users can put the time stamp on the upper left hand corner of the video screen when recording. Supports scheduled recording with event frequency of one-time only or daily recording. Scheduled recording time interval starts from 6 minutes to 550 minutes maximum. Supports microphone input for recording with live commentary. Supports continuous recording mode with no limit of 2GB per file compared with other models on the market. Easy operation by IR remote control. Full-featured video editing/authoring software included for further video editing or post production. Supports software video encoding into various formats such as AVI, ASF, MPEG1, MPEG2, MP4, WMV, QTMOV, etc. Supports digital content playback function for recorded videos, movies, digital photos and text file formats in MPEG, H.264, RM/RMVB, JPEG, BMP, MP3 and so on. Supports recording bit-rate at 4M, 10M or 16Mbps maximum. Recording speed at 120MB per minute or 7GB per hour. Supports all USB hard drive or USB flash drive sizes up to 2 TB maximum in NTFS or FAT/FAT32 format.